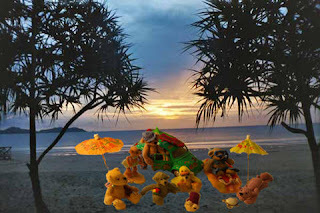 Winner Bears at Play Collectors contest. 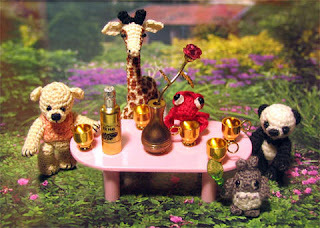 Every month or so, the threadanimals group moderators choose one of our members to be Artist of the Month. It has been so fun getting to know the other members and their work. Alison has agreed to be March's artist of the month, and as part of that has answered some questions about herself to help us get to know her better. I was born and grew up in Hertfordshire, England. My childhood was very happy and as an only child my mum had time to teach me her passion which was knitting. Tell us a little about you and your family. Married? Children? Pets? My Hubby is very patient with my wool ect taking over the house and my daughter cant wait to make her first bear. They all come with me to bear fairs too so I'm very lucky. Any crafts you'd like to learn to do? I'd love to learn tatting. Maybe I'll try this year. Have you had any formal arts & crafts training? No. My mother taught me to knit and my Aunt showed me how to make crochet squares but other than that its just been hit and miss. Although Hubby did surpise me this Christmas with a day at a work shop with Andy West of Westie Bears. It was a wonderfull day and I made a sewn minature bear. How did you get started crocheting? How did you get started making ThreadAnimals ? My Aunt taught me to crochet small squares one summer when I was about 10 but I didn't try crocheting again untill i saw thread bears on ebay a few years ago. 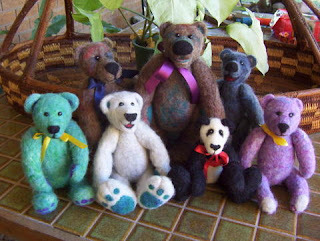 I had been making knitted bears since 1997 and was looking for new patterns. I bought a pattern from Edith Molina and caught the thread bear bug. I'm Inspired by so many people but to name just a few Berta Hesen-Minten ( I am lucky enough to have met Berta at the Hugglets Bear fair in Kensington). Both Berta and her husband are lovely, but my hubby would not let me ask if I could have my picci taken with her :0( Marion Frail is fantastic! I am still trying to master crocheting with eyelash yarn. Karen of GoldCoast Bears makes such lovely bears too. It is one of Karens that I first saw for sale on Ebay. Have any tips for beginner Artists? Just keep at it. You don't realise how much you improve untill you look back at your first bear and if you have any problems ask the guys in the group. They are always so helpfull. I would have to say Tilly is still my favorite bear ( sorry to my other bears) I had such a great time making Tilly and for once I didn;t have to remake parts, even her feet which I usually dread making! I have tried to recreate a bear like Tilly but Just can't seem to. Do you sell Thread Animals? Where can people purchase them if you do? I sell some of my bears on Ebay although I haven't done so for a few months now. I also put bears for sale on my website but the majority of bears have been commisons. I'm always so pleased to be asked to make a special bear. Not being the most confident of people I worry they may not be good enough but its lovely to see a persons smiling face when they open the box to take their first look at a new bear. What does belonging to Thread Animals mean to you ? Have you benifited from joining this group, partisipating in swaps ..etc. 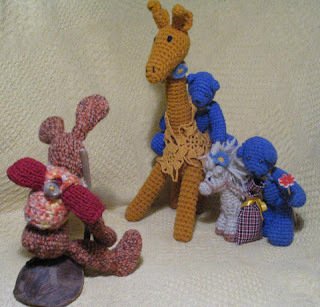 The Thread Animals group has given me a chance to meet some great people and get honest feedback on my creations. I love joining in with the swaps too. 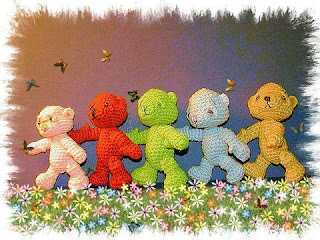 Its exciting waiting for the parcel to arrive and my hug is gaining some fabulous new bears that I otherwise may not have had the chance to buy. We have received many wonderful entries. Here is a sampling. I will announce the winner in my next blog. As always there is a Wealth of Wonderful Choices of what to Include each blog. Too many choices, so I try to choose a sampling that shows the wonderful talents of all the members. Coming up... Mad March Hare swap and Feb highlights.